Avatars are definitely engaging. 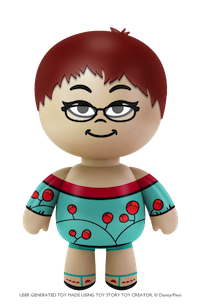 Creating an avatar online is a nice way to involve kids in learning digital literacy skills - they'll learn about menus and buttons, try different effects, and work out what sort of finished product they want. Some kids will choose an avatar that represents themselves, others will choose one representing the way they would like to be, and there'll be kids who want to change avatars daily! Best of all, making a digital avatar is a fun way to create and express yourself online. Recently, I learnt about ToyStory3Creator. Kids will find it just as cute as I did. I tried to capture my essence in this avatar, below. 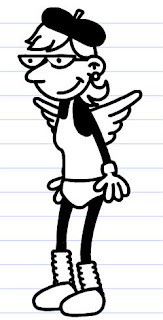 If your kids enjoy Diary of a Wimpy Kid books, why not let them try Wimp Yourself? Kids can choose either a boy or girl to customise. I channelled my inner fashionista to come up with the one below. 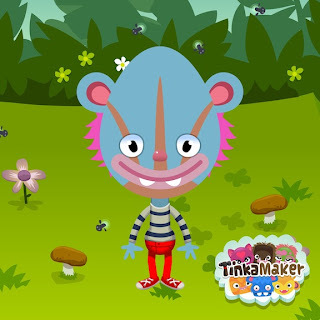 Similar to an avatar maker, but this time in a free iPad app, is TinkaMaker. You get to choose backgrounds and customise your cartoony creature, then you can email it as a jpg. (TinkaTolli also has a website where kids can create Tinkas. ) My Tinka character reveals a hitherto hidden side of my persona, the side desperate to gambol in a sylvan glade wearing shrunken clothing. Cartoon Network UK has a Gumball Character creator that's a little different. It enables the creation of characters with objects for bodies. I chose a teapot from the website's image library for my character's body below, but kids can also use a webcam or upload from computer. They then add features to the object like libs, eyes etc. The site warns them not to use a photo of a real person. Again, not strictly an avatar, but it might make a great prompt for a story. In my ThingLink, embedded below, you'll find some more of my favourite online places to create avatars. Hover your mouse over each separate image and you will see its link and a short description.